Select the image for which you want to set properties, right-click, and select Image Properties. 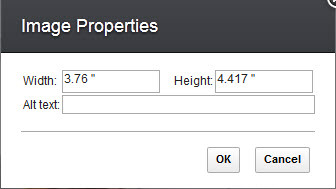 Enter values in the Width and Height fields. Tip: You can drag to resize the image. Click the image to display the handles, and click and drag a handle to resize the image. In the Alt text field, type a description to serve as an alternative if the image cannot be viewed.